Hello you. First off, I’m thrilled to announce that the ultra limited edition 7″ Howlround produced for the Resonance FM fundraiser made a very impressive £306.56! Thanks to everyone who bid so generously and to OneCutVinyl.com once again for donating their services for free. To those of you who missed out (which, given there were only three copies is nearly everyone! ), hopefully the news that Howlround’s next official release will be arriving in the spring is of some consolation. I missed out on a copy as well, incidentally, so your pain is my pain. But there’s no time to sit around feeling sorry for ourselves when the UK’s greatest radio station still needs our assistance, so I would urge you to shake a leg on over to Fundraiser.Resonance.FM and give what you can. Donations are always gratefully received and continue to be sorely needed – there’s still a long way to go before they reach £100,000! Thanks also to everyone who everyone who came down to Club Integral’s Gala Fundraiser at Iklectik last week and witnessed Howlround’s first performance of 2018 – a brief but abrasive feedback affair that might have burnt a few ears and loosened a few bowels in the front row. What fun! Online extracts coming soon! Secondly, a nod and a wink to everyone who tuned into The OST Show last Saturday for my fundraising special standing in for Jonny Trunk, especially Resonance engineer Martin, Alan Gubby for the Buried Treasure Records competition prizes and all the usual suspects who rang in with funny and silly answers trying to win them. The show also featured the only ever performance of ‘Just 4 U, West Malling’ (the B-side of the aforementioned Howlround 7″) in British Radio History, alongside tracks by Jeffrey Siedler, Yuri Morozov, Barry Gray, Jim Henson and much, much more. In short, I bought all of my guns and proceeded to play as many ‘bangers’ as I could fit into two hours. Hopefully the opening salvo of cuts from Raumpatrolle Orion, UFO, Pop Electronique and Georgette Sayegh’s killer, ultra-rare Arabic version of ‘Popcorn’ helped make up for my slightly rambling presentational style, which I’m attributing partly to a late night at Electrowerkz the previous evening (Merkaba Macabre and Pascal Savy were playing! ), a lack of decent coffee and perhaps most of all the surprisingly toxic fillet of cod I had tried to cook for lunch a couple of hours beforehand. Never the finest of chefs, I remember thinking as I took the fish-like substance out of the oven that it bore an uncanny resemblance to some kind of unholy prop from that dinner table scene in Eraserhead, but being very hungry, having no other options and retaining my northern ‘waste not, want not’ thriftiness that 15 years in the south have never shaken off, I felt compelled to carry on regardless. One bite was all it took and the remainder was projectiled right across the kitchen. In retrospect I should probably have replaced it with something more substantial than a carrot and a handful of pistachios, but then hindsight is a wonderful thing. Tasty: Georgette Sayegh’s lunch looks much more appetising! Anyway, nevermind my domestic trifles (although at that moment an actual trifle would’ve gone down a treat), I did promise you a tracklisting for the show once I was fully functioning again, so I’ve included it below. How about that killer Yuri Morozov jam ‘Inexplicable’, eh? As funky as anything KPM ever put out, I’ll wager! Respect is due to Buried Treasure for bringing him to a wider audience! As if that wasn’t enough, I’d now like to bring you another two hours of killer tracks recorded live for WNBC‘s Out Of The Woods show, broadcast the previous Sunday. A very different proposition from the ‘guns ‘n’ puns’ approach of the OST show, this was designed as the perfect soundtrack for a quiet Sunday afternoon. No beats, no banging, just two hours of soundscapes, field recordings and electronics. Esteemed crate digger and fellow WNBC resident DJ Food has described it as ‘…a masterclass in ambience. Absolutely beautiful listen, the restraint and pacing he displays over the two hours is admirable’. Restraint and pacing are rarely accolades I can lay claim to, so you’re advised to fill your boots. If the current trajectory of Howlround is anything to go by, this could be the last ambient thing to have my name on it for quite some time! 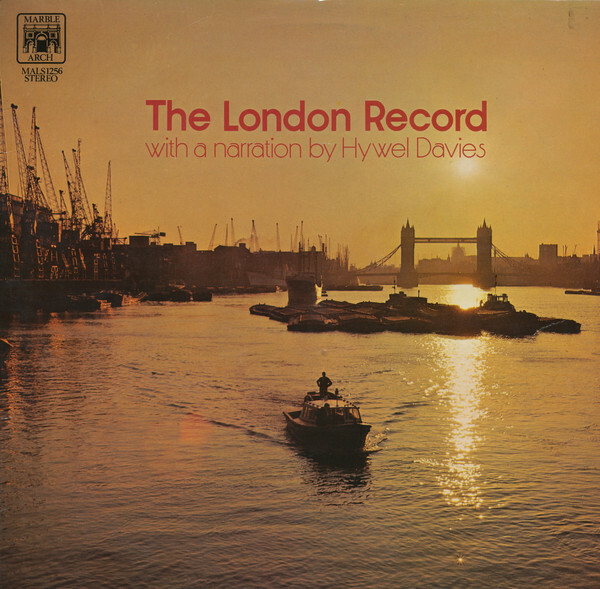 The show is book-ended by The London Record, a 1961 LP on Marble Arch records, featuring narration by Hywel Davies and music by Robert Docker. Despite featuring some truly embarrassing character acting and some rather rinky-dink Cockney-stroll-about music, it’s a glorious, albeit over-romanticised portrait of a bygone age. If the opening monologue describing dawn on the River Thames doesn’t stir something in you, frankly I’m not sure what will. I also play substantial homage to a couple of my other favourite strange records, Argo’s wonderful Steam Railroading Under Thundering Skies and ‘Tintinnabultation’ from Atlantic Record’s Environments series; which work surprisingly well when combined together for extended periods. Later on we hear from Delia Derbyshire, Edgar Froese, Chris Watson, Oval, Ursula Bogner and even an uncharacteristically chilled out affair from 90s jungle maestro Photek, though of course the fact that it’s designed to be a more meditative affair doesn’t mean there can’t occasionally be a few noisy moments! I should really provide you with a tracklisting for this show as well, but I’ve got some people coming round to do some filming of the machines in the morning and the studio is in dire need of an overhaul. Apart from there being tape all over the floor, my poor old speakers have finally succumbed to 20 years of abuse and pretty much exploded, which means it will be a decidedly silent affair unless I can get some new ones wired in, sharp-ish. Will I have time to get everything shipshape before the arrival of the spotlight? On previous form, not a chance in hell. Still, wish me luck…. I’ve made resonant frequency pieces numerous times in the past, of course and each one sounded different, but this was certainly the fastest and the most immediately distinctive to date. Not counting the ten minutes I’ve just spent EQ-ing the results, the whole piece came together in well under half an hour. As the classroom was air-conditioned, filled with computers and situated next to a busy road above the Bakerloo line, we guessed afterwards that these factors were what gave it those deep bass tones, which needed to be significantly rolled-off to prevent speaker damage as we went. What gives it the snarling mid-range frequencies is anyone’s guess! The Field Recording group has also proved most stimulating (for me, certainly – and my students as well, I hope! ), particularly the evening when we went on a Soundwalk around the Waterloo area, armed with various microphones, coil pickups and at least one rather oversized portable reel-to-reel tape recorder – guess who that belonged to?! As ever, carrying clunky recording equipment around on a busy Friday night proved a bit of a faff; but who cares when you discover material like this recording made just under the railway bridge by Lower Marsh? This is being played back at half-speed, but otherwise completely unmolested! Isn’t that wonderful?! In other news, it’s’ fundraising time once again at Resonance FM, the greatest community arts radio station in the world and my spiritual home since 2004. Your help and support is needed more than ever in 2018 as the station now needs £100,000 to fund an evacuation of its Borough High Street studios and the seeking out of new premises – by no means an easy task, given the eye-wateringly ridiculous rents currently being charged in the capital. However, Resonance’s army of volunteers, programme makers, engineers and loyal listeners across the globe have never disappointed yet, so I’m confident that they’re in with a good chance of hitting the magic figure. Do please dig deep, folks. Speaking personally, I can think of no other institution that has given so much to the cultural life of London on such a tiny budget, and the world would be a sadder, sorrier place without it – especially in the current climate of cutbacks! Details of how to get involved can all be found at http://Fundraiser.Resonance.FM, where you’ll find a programme of live events occurring all this week in various venues across London, as well as an online auction of desirable objects and experiences up for grabs. I’d particularly like to draw your attention to two events at Iklecktik on Wednesday 7th and Thursday 8th respectively. The former features, amongst other delights, two of my favourite artists in the shape of veteran sound recordist and improviser Max Eastley, and Dan Wilson, the composer and instrument builder whose Misadventures on the Scorn Cycle was one of my favourite LPs of last year. The latter event is a Club Integral night featuring a number of artists each performing for 13 minutes, including Bob and Roberta Smith’s Apathy Band and my Foggy Self, giving the tape machines their first outing of 2018 (with the exception of Maddalena, who was with me on my aforementioned Morley Soundwalk and appears to have enjoyed it so much that she’s now functioning even less well than before). Hope to see you at one or both – and that no further damage to the machines is incurred, otherwise I’ll be needing to organise a fund-raising programme of my own! This original work by Bob and Roberta Smith is just one of the man covetable items up for grabs. Plus there’s Dexter Bentley’s annual marathon ‘Pay As You Go Hello Goodbye Show’, where once again the long-serving denizens of Resonance’s Saturday lunchtime slot auction off airtime at the rate of £10 per minute. At the time of writing there’s still a few slots available on next week’s programme, February 10th, that are yours to spend as you please – perhaps something from your back-catalogue? A poem? An extract from your memoirs? Whatever you fancy, basically – head to HelloGoodbyeShow.com for details of how to get involved and listen again to part one here. As for me, I’m hoping to announce some special items of my own to be added to the auction in the coming weeks, but am currently finalising details and so hoping to make an official announcement in the coming days – watch this space. In the meantime, here I am popping up as a guest on the Lucky Cat show, attempting to drum up some fundraising business while eating spicy mushrooms and playing Licorice soul. Thanks again to Zoe and Lina for having me!